Local and international markets for virgin coconut oil have expanded rapidly over the past decade but producers need to improve their performance to remain competitive, build on past successes and better appreciate the importance of hygiene and the basics of financial management. 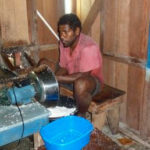 A week long training exercise, supported by the Crawford Fund’s ACT Committee, follows earlier support for the work by Dr Dan Etherington, formerly of ANU, who worked in collaboration with CSIRO and ANU colleagues to develop an all-weather cottage industry technology that has been introduced to a range of developing countries and sees them producing coconut oil of ‘stunning’ quality. This most recent training focused on the principles of hazard analysis and critical control points (HACCP) and basic financial management for village virgin coconut oil production. 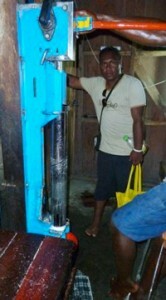 21 of the 31 participants, from five provinces, were from the Virgin Coconut Oil Producers Association who use the ‘dry’ Direct Micro Expelling technology that was developed by Dan and highlighted on the ABC TV New Inventors, and supply their Certified Organic virgin coconut oil to Kokonut Pacific Solomon Islands Ltd (KPSI).